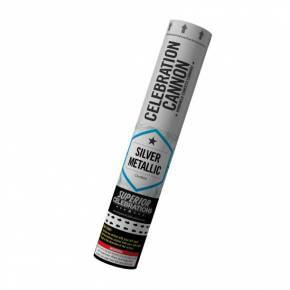 Perfect for any occasion, our 12", Silver Metallic Confetti Cannon is great for smaller rooms or venues. This cannon is loaded with silver, mylar confetti that really shimmers when light hits it! Though shorter than most of our Celebration Cannons, this cannon will still launch a blizzard of silver confetti 10 feet! 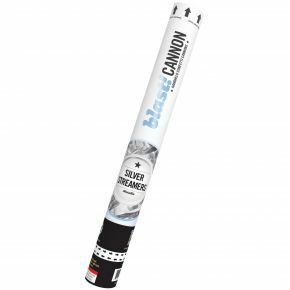 Our 18" Silver Metallic Streamer Cannon is great for weddings, graduations and other special events. This cannon is loaded with silver mylar streamers that shoot up to 30 feet, and are easier to clean up than confetti. Perfect for any occasion, our 12", Gold Metallic Confetti Cannon is great for smaller rooms or venues. This cannon is loaded with gold, mylar confetti that really shimmers when light hits it! Though shorter than most of our Celebration Cannons, this cannon will still launch a shower of gold confetti 10 feet! Our original cannon - updated! These compressed-air, handheld confetti cannons are perfect for big parties and celebrations! To operate, simply hold with both hands and twist the base of the unit to blast confetti into the air! These large confetti cannons are non-pyrotechnic; instead, they use compressed air to fire the confetti, which means no smoke or hot tubes after they are used! For outdoor events, we also recommend our Multi-Color Wedding Confetti Cannons with water-soluble confetti. Our multi-color wedding confetti cannons are a vibrant twist on our popular wedding confetti! These cannons are loaded with multi-color confetti that is 100% biodegradable and water soluble! Your wedding venue will love that it's so easy to clean, when they might not otherwise allow confetti. This cannon is 18" long, and will launch its confetti approximately 10-15 feet in the air. For indoor events, we recommend our multi-color paper Confetti Cannon. White Confetti Cannons are filled with large pieces of white, biodegradable tissue-paper confetti. They are a beautiful, classy addition to any celebration, including weddings! Simply twist the base to launch the confetti approximately 10-15 feet in the air. For outdoor events, we also recommend our Wedding Confetti Cannons with water-soluble confetti. Our wedding confetti cannons are the perfect addition to a wedding celebration! These cannons are loaded with translucent, white confetti. The confetti in these cannons is 100% biodegradable, and water soluble! This cannon is 18" long, and will launch its confetti approximately 10-15 feet in the air. For indoor events, we recommend our White Confetti Cannon. Our 12", Blue Metallic and Confetti Cannon is great for smaller rooms or venues. Though shorter than most of our Celebration Cannons, this cannon will still launch a blizzard of blue confetti 10 feet! With its generic label design, it's perfect for gender reveals! Our 12", Pink Metallic and Confetti Cannon is great for smaller rooms or venues. Though shorter than most of our Celebration Cannons, this cannon will still launch a flurry of pink confetti 10 feet! With its generic label design, it's perfect for gender reveals! Our 18" Green Confetti Cannon is great for any party or event. To operate, simply twist the base to launch a blast of green confetti 15 feet! The biodegradable green confetti is perfect for St. Patrick's Day, sporting events or other green-themed celebrations! Our 18", Red metallic and confetti cannon is great for any party or event. To operate, simply twist the base to launch a blast of red confetti 15 feet! The red confetti is perfect for Valentine's Day, weddings, birthdays, and more! Our 18", Purple metallic and confetti cannon is great for any party or event. To operate, simply twist the base to launch a blast of red confetti 15 feet! The purple confetti is perfect for Mardis Gras, weddings, birthdays, and more! Celebrate July 4th with our red, white, and blue confetti cannon! At 24" long, this cannon is the largest we offer, and the tissue-paper confetti is biodegradable. Like all of our Celebration Cannons, this cannon uses compressed-air to blast its patriotic confetti 15-20 feet in the air! Four of our popular 12-inch confetti cannons, two with blue confetti, and two with pink confetti. Each one has a mix of metallic mylar and paper confetti, and launches about 10 feet into the air. Plus, these confetti cannons have a generic design so you can't see the color until you're ready for the big reveal! If you already know which color you need, you can also buy just Blue Confetti Cannons or Pink Confetti Cannons! Perfect for Halloween! This 18" confetti cannon is loaded with metallic cutouts of black bats and orange pumpkins. Simply twist the base of the cannon to launch confetti 10-15 feet in the air! A blast of purple powder that's perfect for outdoor color events! These compressed-air cannons are filled with a water-soluble rice powder and are super ease to use. Just twist the base to launch a cloud of color! A blast of blue powder that's perfect for outdoor color events and gender reveals! These compressed-air cannons are filled with a water-soluble rice powder and are super ease to use. Just twist the base to launch a cloud of color! A blast of green powder that's perfect for outdoor color events! These compressed-air cannons are filled with a water-soluble rice powder and are super ease to use. Just twist the base to launch a cloud of color! A blast of pink powder that's perfect for outdoor color events and gender reveals! These compressed-air cannons are filled with a water-soluble rice powder and are super ease to use. Just twist the base to launch a cloud of color! A blast of yellow powder that's perfect for outdoor color events! These compressed-air cannons are filled with a water-soluble rice powder and are super ease to use. Just twist the base to launch a cloud of color! This electrically-fired confetti cannon contains a mix of white paper slips, metallic silver slips, and metallic silver streamers that shoot 15-20 feet! They come ready-to-use with a compressed-air canister, and are disposable after firing. They're a cost-effective addition to productions for churches, schools, DJs, and other stage events. NOTE: Electric confetti cannons require a 12-volt electric confetti launcher to fire, and cannot be fired manually. This electrically-fired confetti cannon contains a mix of silver streamers and slips that shoot 15-20 feet! They come ready-to-use with a compressed-air canister, and are disposable after firing. They're a cost-effective addition to productions for churches, schools, DJs, and other stage events. 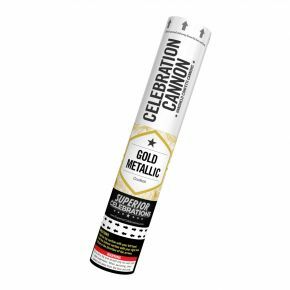 This electrically-fired confetti cannon contains a mix of metallic colored slips that shoot 15 feet! They come ready-to-use with a compressed-air canister, and are disposable after firing. They're a cost-effective addition to productions for churches, schools, DJs, and other stage events. This electrically-fired confetti cannon contains white tissue paper slips that shoot 15 feet! They come ready-to-use with a compressed-air canister, and are disposable after firing. They're a cost-effective addition to productions for churches, schools, DJs, and other stage events. 1 KG (2.2 LBS) of pink paper confetti slips. Can be used with our confetti blower or to fill your own custom confetti cannons (not our preloaded confetti cannons). 1 KG (2.2 LBS) of pink mylar confetti slips. Can be used with our confetti blower or to fill your own custom confetti cannons (not our preloaded confetti cannons). 1 KG (2.2 LBS) of blue mylar confetti slips. Can be used with our confetti blower or to fill your own custom confetti cannons (not our preloaded confetti cannons). 1 KG (2.2 LBS) of silver mylar confetti slips. Can be used with our confetti blower or to fill your own custom confetti cannons (not our preloaded confetti cannons). 1 KG (2.2 LBS) of yellow paper confetti slips. Can be used with our confetti blower or to fill your own custom confetti cannons (not our preloaded confetti cannons). 1 KG (2.2 LBS) of purple paper confetti slips. Can be used with our confetti blower or to fill your own custom confetti cannons (not our preloaded confetti cannons). 1 KG (2.2 LBS) of red mylar confetti slips. Can be used with our confetti blower or to fill your own custom confetti cannons (not our preloaded confetti cannons). 1 KG (2.2 LBS) of orange paper confetti slips. Can be used with our confetti blower or to fill your own custom confetti cannons (not our preloaded confetti cannons). 1 KG (2.2 LBS) of gold mylar confetti slips. Can be used with our confetti blower or to fill your own custom confetti cannons (not our preloaded confetti cannons). 1 KG (2.2 LBS) of green mylar confetti slips. Can be used with our confetti blower or to fill your own custom confetti cannons (not our preloaded confetti cannons). 1 KG (2.2 LBS) of green paper confetti slips. Can be used with our confetti blower or to fill your own custom confetti cannons (not our preloaded confetti cannons).